Directed by Brian De Palma and starring Tom Cruise, Mission: Impossible was a critical and commercial success when it opened in May of 1996. Based on the 1960s CBS series of the same name, the action-packed spy thriller grossed $75 million in its first six days, surpassing the record set by Jurassic Park, and became the third highest-grossing film of that year, bested only by Twister and Independence Day. Two decades later, the Mission: Impossible series has grossed more than $2.8 billion worldwide, becoming one of the most successful franchises in movie history. 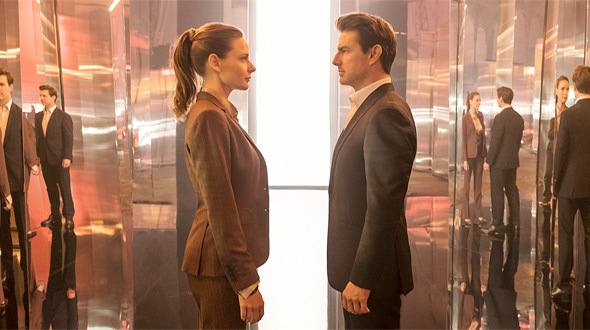 The latest installment, Mission: Impossible - Fallout, is written and directed by Christopher McQuarrie, who helmed the last entry in the series, 2015's Mission: Impossible - Rogue Nation. Cruise returns for his sixth assignment in the role of Impossible Missions Force (IMF) team leader Ethan Hunt, but does he accomplish anything, or is the follow-up set to self-destruct? A direct sequel to McQuarrie's Rogue Nation, Fallout brings back villain Solomon Lane (Sean Harris), a former MI6 special agent who went rogue and became the leader of a terrorist organization known as "The Syndicate". After Hunt captured Lane in Rogue Nation, a splinter group of The Syndicate members form a doomsday cult called the Apostles. The Apostles are trying to obtain refined plutonium to carry out a series of nuclear strikes to bring about a "great suffering" that will cleanse the planet and yield a greater peace. In response, Hunt puts together a mission to buy the plutonium before the Apostles can get their hands on it, enlisting his usual cohorts: computer specialist Luther Stickell (Ving Rhames, who has co-starred in all six M:I movies so far) and technical field agent Benji Dunn (Simon Pegg). 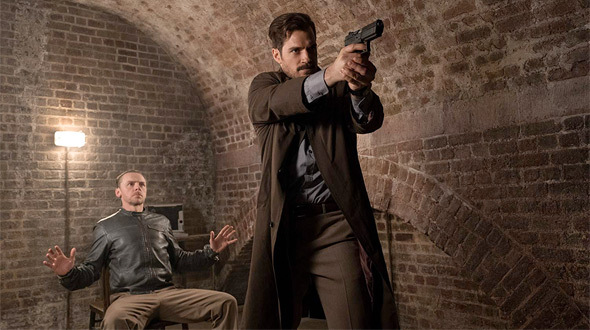 When the initial mission goes awry, CIA Director Erica Sloane (Angela Bassett) has some serious trust issues with the IMF, so she pulls rank on Secretary Hunley (Alec Baldwin) and assigns burly, mustachioed agent August Walker (Henry Cavill) to join the team shadowing Hunt while he goes undercover to recover the nuclear material before the Apostles carry out their apocalyptic undertaking. Their mission, should they choose to accept it, and – spoiler alert – they do, takes them on a globetrotting adventure where they'll get mixed up with Parisian arms broker White Widow (Vanessa Kirby of Netflix's The Crown) and a returning Ilsa Faust (Rebecca Ferguson), the badass MI6 operative first introduced in Rogue Nation. Fallout feels like the culmination of all the previous movies in the franchise. Not only is it the first direct sequel of the series, but there are connections to every movie in the saga, including a veiled reference to Vanessa Redgrave’s character from the first one and a sentimental coda to the romance with the character Julia, played by Michelle Monaghan, from Mission: Impossible III. One of the signature elements of this franchise is that there has been a different director for every movie; Fallout is unique in that it's a writer-director's second impossible mission. While McQuarrie changes up the visual language from the previous installment, giving Fallout a distinct look and feel, he also brings much-needed continuity to the series by finishing the story he started in Rogue Nation and tying up a few loose threads. McQuarrie, cinematographer Rob Hardy (Ex Machina, Annihilation), and stunt coordinator and second-unit director Wade Eastwood stage incredible set pieces, including a HALO jump from an airplane, a high-speed motorcycle chase through the streets of Paris, and a heart-stopping sequence in which Cruise swings from a rope dangling from a helicopter flying at 2,000 feet. The Impossible movies are known for death-defying stunts and Fallout is no exception; 56-year-old Cruise goes out of his way to make you feel Hunt's desperation in every scene, risking life and limb to lend credibility to the action. Perhaps what's most impressive is that these taut, adrenaline-fueled set pieces still find time for great character moments, building on previously established relationships while introducing memorable new characters to the canon. Speaking of the characters, the performances in Fallout are pitch-perfect. Cruise is an honest-to-goodness movie star whose charisma, presence, and commitment to character are more than enough to carry a movie. Here, Cruise is part of a stellar ensemble in a story where everyone gets a moment to shine. Rhames, Pegg, Ferguson, and Harris are fantastic, but it's the new characters played by Henry Cavill and Vanessa Kirby I find most intriguing. As entertaining as Cavill's turn is in The Man from U.N.C.L.E., Fallout is the actor's best work yet by far. His muscle-bound brute is no doubt intimidating, but Cavill gives the assassin a touch of sophistication. There's a great deal of friction between Walker and Ethan, which comes to a boil over the course of the film, and Cavill more than holds his own against Cruise – they feel like equals, which isn't an easy thing to accomplish as a newcomer in the mega-star's signature franchise. Fallout is equal parts Jack Reacher, Skyfall, and The Dark Knight, an action thriller on a grand scale, with clockwork plotting, bruising physicality, and well-timed wit. If there are any drawbacks, it's that Fallout is 147 minutes – the longest of the series – and while it's non-stop fun and excitement, McQuarrie's film will leave you thoroughly exhausted. My only real complaint beyond that is the absence of Paula Patton's Jane Carter and Jeremy Renner's William Brandt. Both actors played significant parts in previous films, and it feels like they should be included if Fallout is to be the real culmination of the series. Then again, I'm highly skeptical that this is the last impossible mission Cruise and his collaborators will accept if box office receipts have anything to do with it – and they do. As long as Cruise is fit enough to run insanely fast and jump off really high things, whether they be vehicles or structures or natural features, there will be M:I movies, and plenty of opportunities for old faces, or new faces wearing old faces, to show up. Overloaded with exhilarating stunts, high-tech spycraft, and fun character beats, Mission: Impossible - Fallout is one of the most entertaining blockbusters of the summer. McQuarrie's expertly choreographed action set pieces have a fluidity that makes them both unpredictable and organic. Though my personal favorite is still Brad Bird's Ghost Protocol, it’s clear that McQuarrie is tailor-made for this franchise. The writer-director excels at putting characters into increasingly stressful situations that can only be survived by adaptation or evolution, a notion which is the perfect metaphor for this brand. McQuarrie’s movie has proven that the continued global success of this series is not only possible but probable.